I bloomin’ love festivals. From the classic British ‘grab some wellies and decanter some vodka into a plastic bottle’ ones to the ‘drown yourself in glitter and dress to impress’ ones. I love the whole vibe – the music, the friends, the food (always the food). And most of all, the fashion (we won’t talk about the toilet situation though…). Festival fashion has become a muse of mine. I love the glitter, the crochet, the fringe – all of it. Whatever the weather, it’ll be full kit festival wear. Always. As soon as Coachella comes around I seem to come out of this sort of hibernation and spend hours watching YouTube videos and pinning their outfits and makeup on Pinterest. Festivals are an excuse to go as crazy or as cas’ as you like. Especially from what I’ve seen this year. It’s also become a lot more about being a form of self expression which I am allll about. However I feel like in England there’s still more of a less is more impression, which I’m a fan of. With most things I go for basic but ‘blinged’ up. Outfits can go from everyday to festival ready with a little bit of jewellery. And for an outfit that’s going to event that is likely to get scuffed and maybe lost, you don’t want to fork out masses for an outfit. Also trying to look out for my students out there! This year I’m kitting myself out from the Boohoo festival range which you can find here. 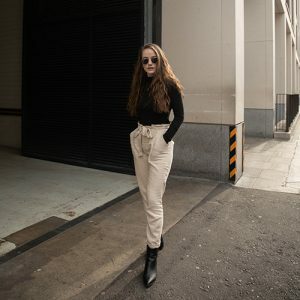 Boohoo has always been a go-to for me, they have such great and affordable fashion for all occasions! And their festival shop has bits for every sort of person at the festival – the glitter coming out of her ears to the too much Budweiser in my bag to bring clothes. For my festival threads I’m all about the bohemian but basic vibes. I’m whacking out some staple black high waisted shorts and a bralet with some classic ankle boots (however knowing classic British festival weather maybe keep the wellies close by!) And of course decked out with some summer chains. Too add a little something something. It’s definitely a take on the classic trend and completely budget friendly! And can we just talk about these boot chains…I never even knew these were a thing but they’re perfect for festivals! You just clip ’em on like you would a necklace and they jazz up any boot with very little effort! Writing this post has me even more excited for some summer adventures! What are your favourite festival trends? What are you packing in your festival bag this year? *This post contains items gifted to me. All opinions are my own. These photos are incredible Em. I absolutely love festival season and I’ve got a few bits lined up for summer already, eeekk!! You are so beautiful and so the photos. These photos look amazing and I’m loving this outfit you’ve got on!